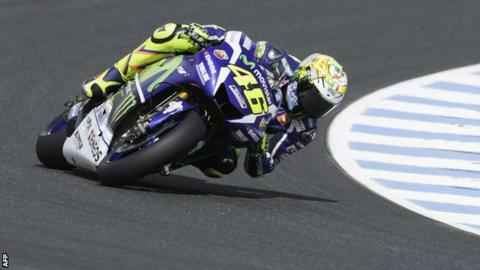 Seven-time MotoGP world champion Valentino Rossi has signed a two-year extension with Movistar Yamaha. The 37-year-old Italian, whose first race for Yamaha came in 2004, will remain as part of the team's rider line-up for the 2017 and 2018 seasons. The 2016 campaign begins in Qatar on Sunday, with Rossi looking to improve on his runner-up spot to Jorge Lorenzo last year. "I am very satisfied with this decision," said Rossi. "It has always been my plan to compete in motorsport for as long as I can be competitive and find it enjoyable at the same time." Rossi has finished second in the World Championship in both seasons since returning to Yamaha from Ducati in 2013. He has qualified fifth fastest for Sunday's race, with world champion Lorenzo taking pole position on an all-Spanish front-row that also included Marc Marquez and Maverick Vinales.